A good kitchen looks fantastic and has space for everything you want, wherever you want it. That's why the right kitchen furniture can transform your kitchen from a place of overstuffed cupboards and crowded surfaces to a beautiful, serene and tidy cooking haven. Here at Furniture Barn, we strive to have the right kitchen furniture for you. See more about the products and styles we stock below, from kitchen islands to barstools, and from rustic to contemporary styling. A kitchen island is like several pieces of kitchen furniture rolled into one, with its handy shelves and cupboards and useful drawers. If you lack space in the kitchen, a kitchen island can fulfil lots of functions without taking up too much room – plus it provides a bit of extra prep area. Some of our islands even include integrated knife blocks and wine racks, as well as other useful features such as baskets for storage. A stone inlay can give the top surface additional durability. Pantry and larder cupboards are the one stop shop for storing foodstuffs, with everything from drawers to baskets to hardy internal door compartments for storage. They are also weighted to prevent toppling. Like the kitchen island, a larder cupboard fulfils the function of lots of kitchen furniture at once, in this case providing one tall, strong container to replace several kitchen cupboards. This makes it a fantastic way to conserve space. Plus, with everything in one place, you can see exactly what you've got in the house without having to hunt through the entire kitchen. Use it to keep your kitchen cupboards clear of clutter or as a home for your regular cooking ingredients – whatever suits you best! Bar stools are a must-have piece of kitchen furniture for any kitchen diner. At just the right height to suit a breakfast bar, they are practical and great for entertaining, not to mention easy on the eyes! Not only do they have lasting visual appeal, they're also useful for saving space, since family and guests can have breakfast at the counter rather than sitting at a separate kitchen table. 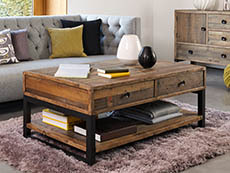 Use leather upholstery for a smart, sleek look, or try something with a wooden seat and back as a rustic alternative. Our bar stools come in both cross back and slat back designs. Our kitchen furniture also comes in a variety of styles to suit all tastes. For modern kitchen furniture, try one of our elegant contemporary painted options, which look great as part of a farmhouse style kitchen. Paint colours like white, grey and cream can be matched to plenty of different colour schemes. 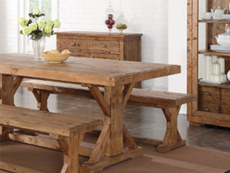 Oak kitchen furniture is good for a rustic style thanks to its beautiful colour and a woodgrain filled with character. 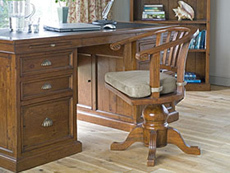 Breadboard ends and chunky legs and tops are all typical features of rustic style furniture. Finishes like wax and oil help repel water – practical as well as attractive. So, what are you waiting for? Browse our kitchen furniture store today and get the most from your kitchen.